Multiple U.S.-based sources involved in the battle to save a popular USO port in the Israeli city of Haifa in the late 1980s corroborated accusations that secretary of defense nominee Chuck Hagel fought to close the hub. The Washington Free Beacon reported last week that during his tenure as the USO’s top official Hagel attempted to cut funding for the USO Haifa Center, telling a group of Jewish leaders in a 1989 meeting that the American Jewish community should bankroll the port, according to sources present in the meeting. "He said to me, ‘Let the Jews pay for it,’" Marsha Halteman, director for military and law enforcement programs at the Jewish Institute for National Security Affairs (JINSA), told the Free Beacon last week. Halteman reiterated her recollection of that meeting when contacted by the Free Beacon Monday. Other sources corroborated this version of events, telling the Free Beacon that Hagel’s desire to cut the USO Haifa’s funding drew a stern reaction at the time from many American Jewish leaders. Charles Wax, whose father Morris helped raise $60,000 to keep the Haifa USO port operational, recalled his father’s anger over the funding dispute. "My dad was on the USO board with Hagel," the former Republican Nebraska Senator who served as CEO of the World USO from 1987 to 1990, Wax said. "When he heard the Haifa USO was going to be closed, he was very upset," Wax said. "He used to smoke these foot long cigars and was about ready to eat one whole. He didn’t like what Hagel was doing." Morris Wax resolved to raise the necessary funds independently, his son recalled. "He was very, very angry about it," said Wax. "[Morris] would get on the phone with people and be fuming. He was really angry about this." Hagel viewed the USO Haifa port "as something the American Jewish community should support," said another U.S. source involved in protecting the port’s funding. "My conversation with Hagel was that this thing is costing too much money, that I don’t want to pay for it," the source said. "If the Jews want to have it they should pay for it. It was all about money." Hagel is said to have insisted that the USO Haifa hub was costing the USO, which was facing a budget crunch at the time, too much money. However, insiders disputed this claim. Hagel "said this thing is costing too much money and if the Jews want it why don’t the Jews pay for it," said the source involved in keeping the port open. "That’s what really bothered me because all USOs run at a deficit. That’s why you fundraise. But it turns out the USO [in Haifa] wasn’t running in any way a major deficit." Hagel "thought, ‘I’ll get it [the money] from the Jews,’" the source said. These sources dispute a recent Atlantic article written by a prominent Hagel supporter who interviewed two Israeli sources claiming that Hagel was a "gift from God" for the Haifa USO port, which was a popular destination for U.S. troops serving abroad. However, U.S. sources involved in the effort to keep the USO Haifa port operational said these Israeli sources were neither present at nor involved in the 1989 D.C. discussions that took place with Hagel. One of the Atlantic’s sources, Gilla Gerzon, the former director of the USO’s Haifa port, told the Free Beacon Monday that she did not recall being involved in the funding battle that erupted between D.C.-based Jewish leaders and Hagel. "I wasn’t there. I was actually in Israel," Gerzon said, explaining she did not have any recollection of participating in the D.C. meeting with Hagel. Gerzon remained effusive in her praise of Hagel but was unable to provide any information about the contentious funding dispute. Hagel’s conversations took place with Jewish leaders and other advocates in D.C., said one of the U.S. sources involved in keeping the Haifa USO port open. "That’s not a conversation he would have had with Israelis," explained the source. The Atlantic interviewed "two people who had no idea what was going on in the United States," the source explained. "The people in Israel were not at all involved in the conversations in Washington." "I never met any Israelis in the U.S. coming to the USO for this purpose ever," said the source. "If you were Hagel, there was no reason to have that conversation with Israelis. He wasn’t saying Israel or the government of Israel should pay." 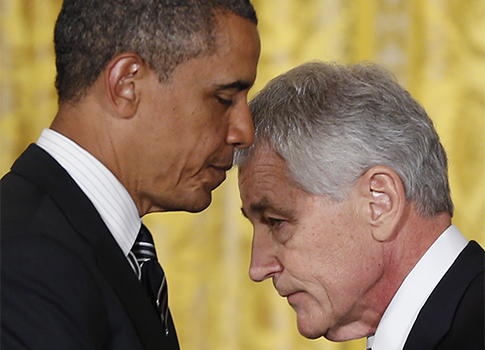 The source recalled having expressed concern about Hagel to Gerzon. "I had that conversation with Gilla more than once because I expressed reservations about Hagel," recalled the source. "I tried to explain to her the problem of the money in the U.S. and the problem of the USO system wanting the American Jewish community to fundraise for Haifa explicitly," the source said. "[Gilla] said that’s not the part of the USO I deal with." "This was entirely separate from any trip to Israel [Hagel] was going to take because that’s not what it was about," the source said. "It was about the money. It was about the books." The events are detailed in a forthcoming book about Morris Wax, the American who helped save the USO Haifa. "Gerzon became especially grateful to Morris [Wax] in the early 1990s, about the time of the First Gulf War, when Chuck Hagel, the new director and future U.S. Senator from Nebraska, announced plans to shutter the facility in Haifa because of a budget deficit," the book states. "Marsha Halteman, program director for the Jewish Institute for National Security Affairs (JINSA), said that the shortfall was between $25,000 and $50,000, and ‘Morrie came through,’" Halteman recalled in a 2011 interview for the book. "It's a short story; that USO stayed open in Israel because of Morrie, no doubt about it." "It was not only a question of [Wax] partially contributing and partially raising the necessary funds, [Halteman] added," according to a copy of the manuscript obtained by the Free Beacon. "As a member of the USO board, he also pressured Hagel to make the USO in Israel a permanent entity." This entry was posted in Politics and tagged Barack Obama, Chuck Hagel, Congress, Middle East, Obama Administration, Secretary of Defense. Bookmark the permalink.